Concept: Do you love dogs? Then you’re like many others as there are over 89 million dogs who live in households in the United States as pets. 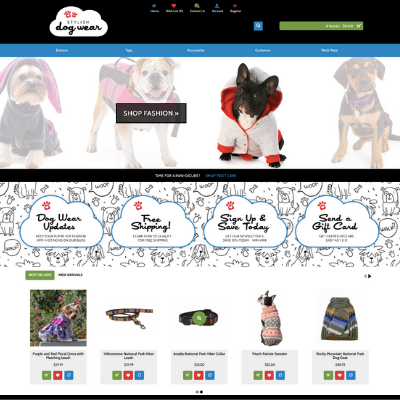 That’s why Pure-Ecommerce is excited to launch this fun to run online pet business – Introducing StylishDogWear.com! Here dog owners can shop for an assortment of stylish products perfect for their pooch including dresses, tops, accessories, costumes, and neckwear. 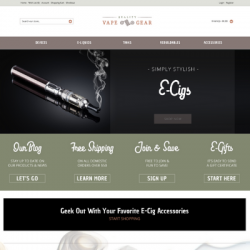 All the products featured on this website are from drop ship vendors. This means you will not be required to hold any inventory. Plus, our team will load the first 300 products to get you started. 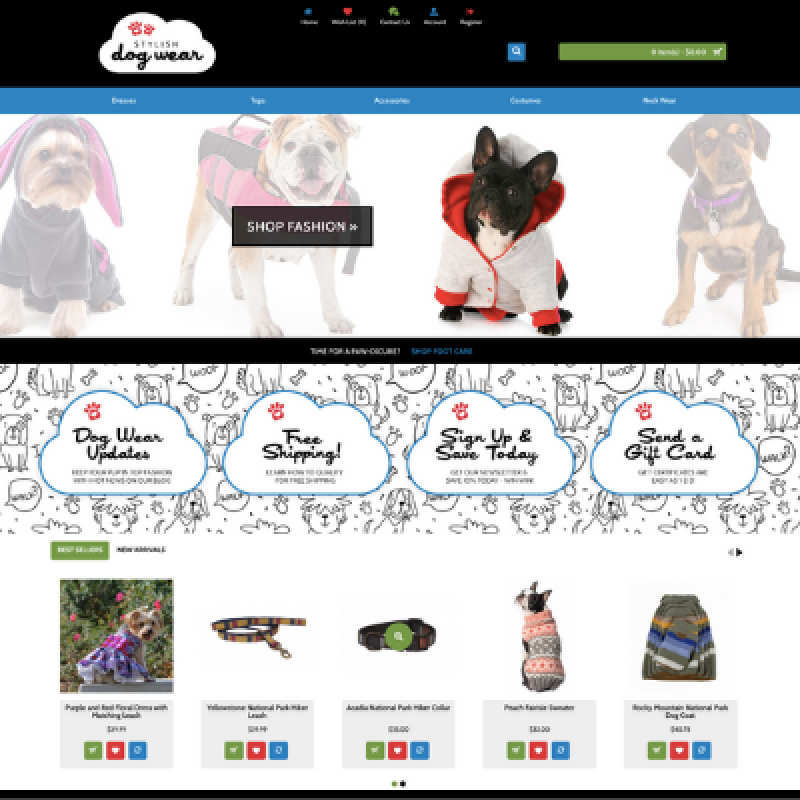 StylishDogWear.com is a 100% responsive website and it many outstanding features including easy navigation for shoppers, eye-catching design and marketing messages, plus your customers will have quick access to the connected blog, newsletter sign-up, and social media pages. This will allow you to post tips and insights to inspire dog lovers to shop at this adorable online boutique for dogs! New to ecommerce? If you are ready to work and have a passion to run your own business then let our team help you get started! 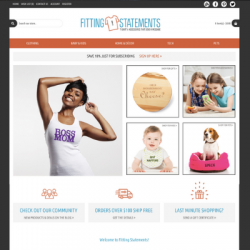 This website will include 40 hours of ecommerce consulting, access to our eLearning Library that houses our 10 step instructional process to help you set up, learn to run and market your new online business. Are you ready to put your passion for dogs to work for you? Then take the first step now - Register or Log In to view our website option pricing and learn more on to get started. Have questions? Click to schedule your introductory call with our owner, Jeff Varner, he will discuss the websites that interest you and answer your questions about getting started. The APPA also reports Americans spent an all-time high of $55.7 billion on their pets in last year and spending will creep close to $60 billion this year. Pet owners purchase holiday presents, designer outfits, and specialty shampoos for their pets. This increased personification of pets has resulted in a massive increase in the number of premium products available for pet care. Personalized and designer products and even high-tech gadgets, such as automated food dispensers, have become the norm. In a recent survey, 68% of respondents said they treat their pets as well as they treat their children!